SG5 Pompeii, Tombs at Stabian Gate or Porta Stabia. Unnamed altar style tomb with graffiti on door. Excavated 2001-2. D’Ambrosio A., 2003. Rivista di Studi Pompeiani XIV, p. 287. Campbell V. L., 2014. 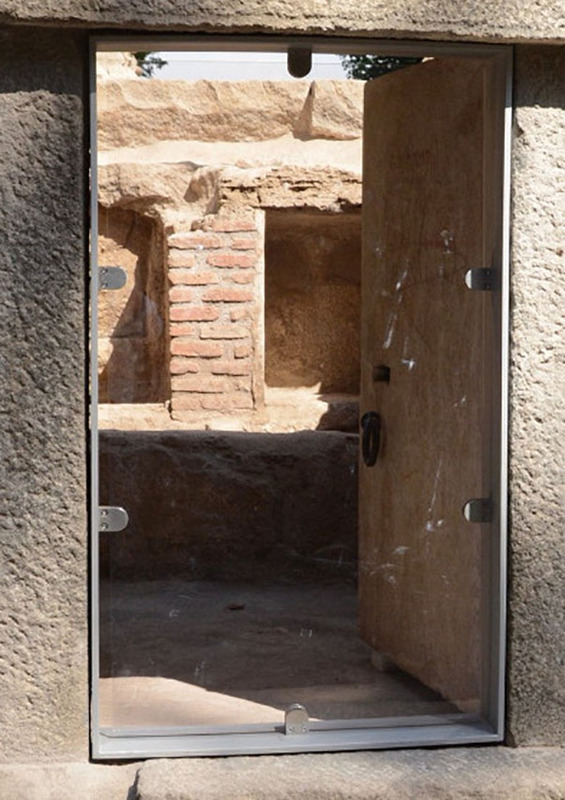 The Tombs of Pompeii: Organization, Space, and Society. Routledge: Abingdon UK, p. 304-5. Emmerson A., 2010. Reconstructing the Funerary Landscape at Pompeii's Porta Stabia: Rivista di Studi Pompeiani 21, pp. 80-81, fig. 7. 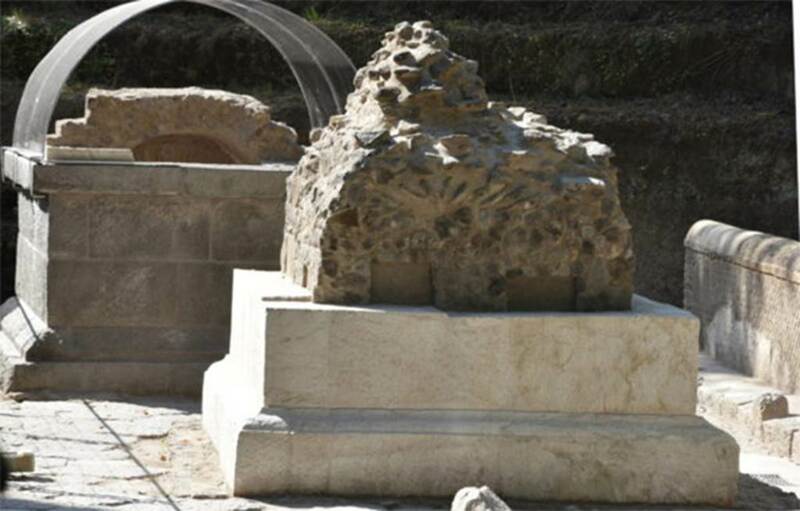 During work intended to turn the gate into a new tourist entrance, two tombs were uncovered beyond the scholae to Marcus Tullius and Marcus Alleius Minius. It was expected that the excavation, started in the summer of 2001, would bring to light a further stretch of the road that leaves Porta Stabia and perhaps the intersection with the via pomeriale along which excavations made in the mid-1800s identified funerary monuments. A first result in this sense was achieved. It was, in fact, the continuation of the Via Stabiana out from the city. It was lined with a wall, with a top capping, in a careful opus reticulatum work, dressed in white plaster, largely preserved. About 60 metres from the gate two tombs were found. 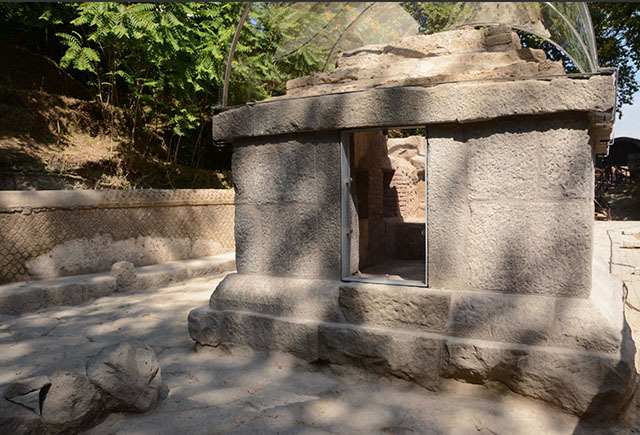 Both tombs had been heavily damaged by modern building activity prior to their excavation, but they appear originally to have been podia with interior burial chambers, likely topped by altars. See D’Ambrosio A., 2003. Rivista di Studi Pompeiani XIV, p. 287. The southernmost tomb [SG5] is entered by a door on the south wall. The door consists of a solid slab of white limestone, which was secured by a bronze lock. Two pieces of graffiti are preserved on the front of the door, a testimony to the heavy traffic that travelled through this necropolis. Inside the tomb, the chamber is paved in Opus Signinum, and the walls and vault are covered in white plaster. The east, west, and north walls each contain two small rectangular niches, nearly all of which held glass or ceramic cinerary urns at the time of excavation. One of these urns contained, in addition to ash and burned bone, seven glass unguentaria and a lamp. The reports do not mention any columelle found associated with the tombs. See Emmerson A., 2010. 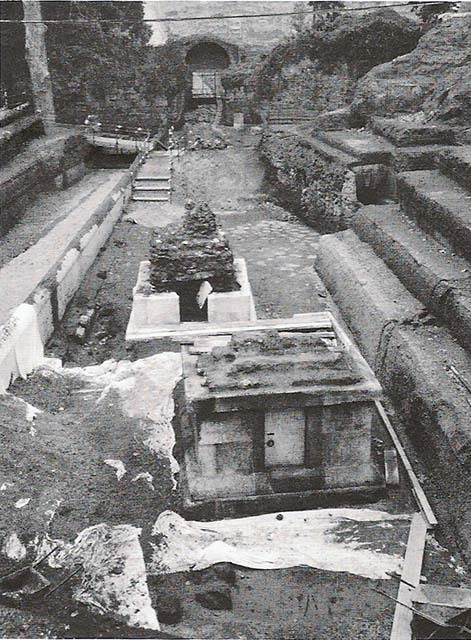 Reconstructing the Funerary Landscape at Pompeii's Porta Stabia: Rivista di Studi Pompeiani 21, pp. 80-81, fig. 7. SG5 Pompeii. 2015. 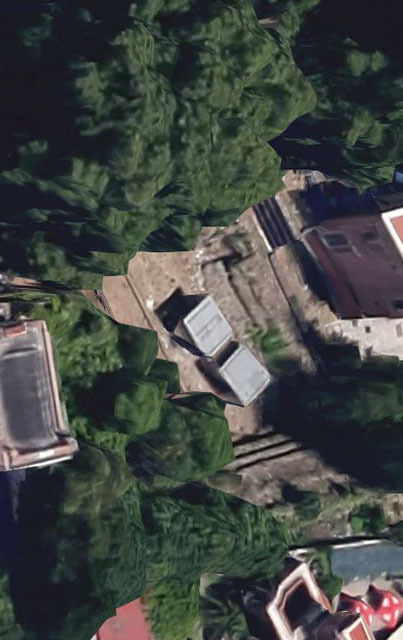 Location of tombs SG4 and SG5 (centre of photo) south of Porta Stabia. SG4 and SG5 Pompeii. 2018, after restoration. Unusually the tombs appear to be placed in the middle of the road. Photograph courtesy of Parco Archeologico di Pompei. SG4 and SG5 Pompeii. 2018, after restoration. Sides facing north towards the Stabian Gate. SG5 Pompeii. 2018, after restoration. Side facing south away from the Stabian Gate. SG5 Pompeii. 2015. Tombs SG4 and SG5, with roofing and scaffolding, with Porta Stabia in the background. SG5 Pompeii. 2015. 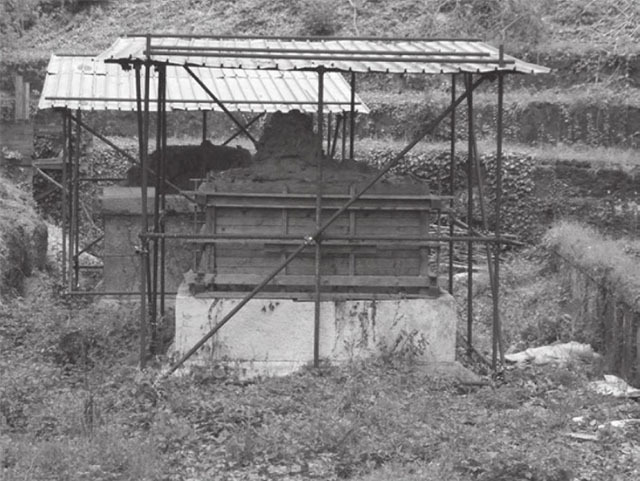 Tombs SG4 (left) and SG5 (right), with roofing and scaffolding. Tomb SG5 Pompeii. Looking north across SG5 and SG4 to the Porta Stabia. According to Campbell, this is an altar type tomb, with a podium consisting of a substructure 0.18m high, a moulded base 0.35m high, two courses of large blocks 1.25m height and a projecting course of stone blocks 0.28m high all of limestone. Travertine facing (0.16m) was still in situ on the north and east sides. Evidence of two steps and part of core of tufa on the south side suggest an altar superstructure. The interior of the tomb is a single room with vaulted ceiling, cocciopesto floor and some traces of white painted stucco. Three of the walls contain two rectangular niches each, and all but one held glass cinerary urns containing burnt bones. The door is in the fourth, south, wall. Graffiti was found on the door. A clay lamp and seven glass ointment jars were found in the tomb, dating it stylistically to the 1st century AD. The construction method dates it to mid to late 1st century. See Campbell V.L., 2014. 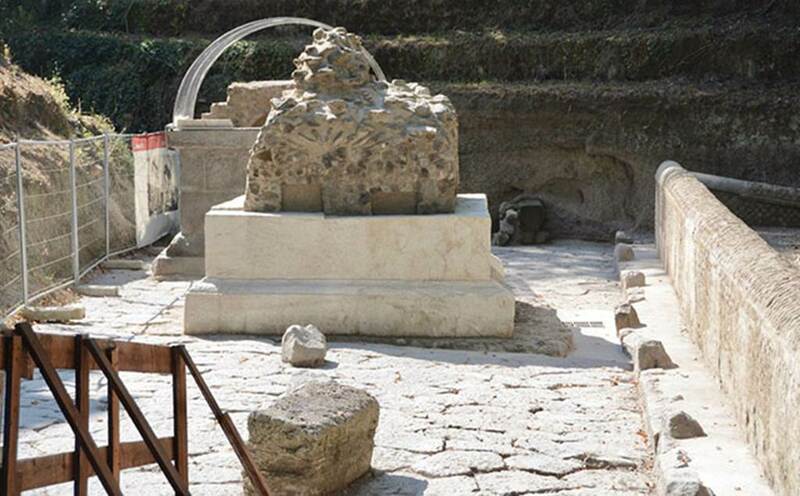 The Tombs of Pompeii: Organization, Space, and Society. Routledge: Abingdon UK, p. 304-5. On the left is a wall in opus incertum. Tomb SG5 Pompeii. 2002. Looking south across SG4 to SG5. The projecting course of stone blocks 0.28m high, all of limestone can be seen. Tomb SG5 Pompeii. 2002. Door with graffiti. Photo courtesy o! 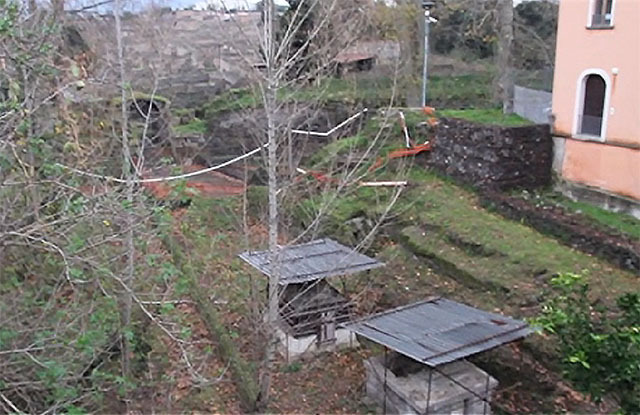 the Pompeii Archaeological Research Project: Porta Stabia. The door in the south wall is a single block of limestone 1.68m high by 0.85m wide, with a well preserved bronze lock. 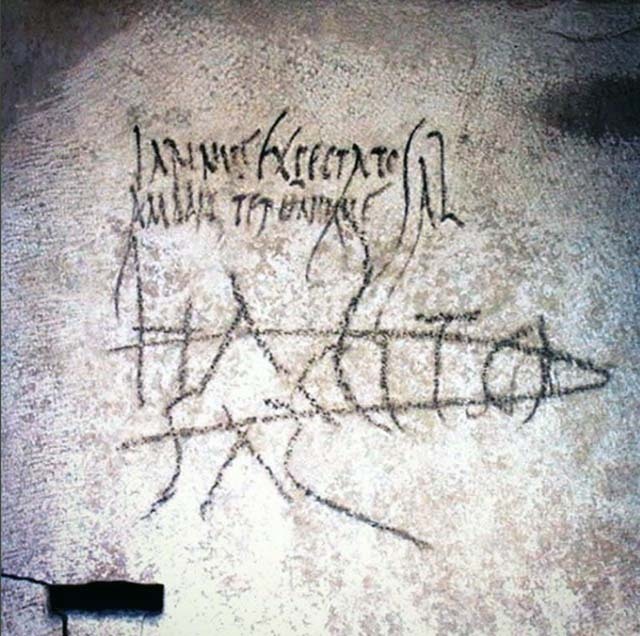 The bottom graffito reads HABITO SAL ("greetings to Habitus '), and was crossed out at some point in antiquity. The top is less clear and seems to contain several misspellings. It reads LARINUS EXPECTATO AMBALITER (perhaps a misspelling of amabiliter) UNIQUE (perhaps for ubique) SAL (“Larinus sends greetings to Expectatus as a friend forever”). Salutation graffiti of this type is common on the tombs of Pompeii. Tomb SG5 Pompeii. 2002. Graffiti on door in south wall. Over the name of Habito someone drew a phallus. 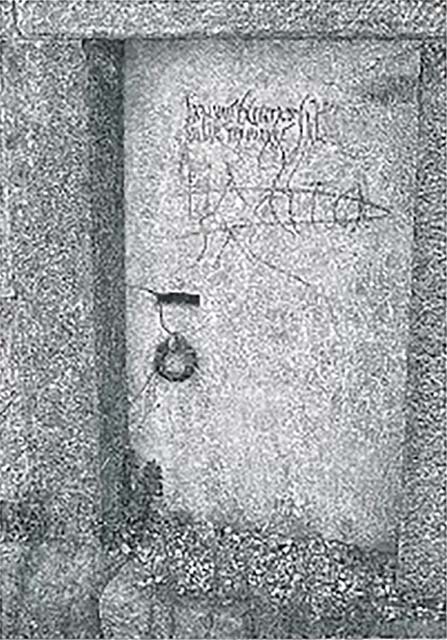 According to Emmerson, the bottom graffito reads HABITO SAL ("greetings to Habitus '), and was crossed out at some point in antiquity. SG5 Pompeii. 2015. 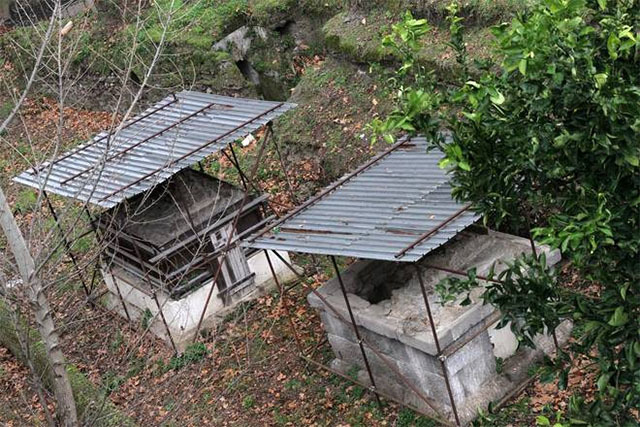 Tombs SG4 (top) and SG5 (below), between buildings. In the 2002 excavations at the southernmost end of the excavation area [south of SG5], a trench was opened towards the east. 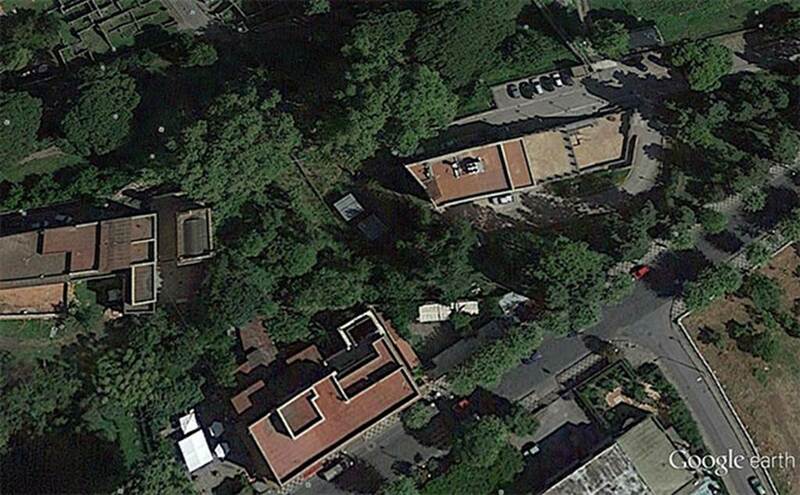 This was to explore the possible location of the junction of the Via Pomeriale and the road out of Porta Stabia. In the first layers of ash, just above the lapillo top layer, three partially preserved skeletons were found. SG4 and SG5 Pompeii. 2018. Gold ring with the head of a serpent found in road by the tombs. The paved road was in fact completely covered with a thick layer of alluvial accumulation that has returned a large amount of ceramic artifacts, such as glassware and pawns but also a gold ring with two snake heads facing and with eyes in glass paste.